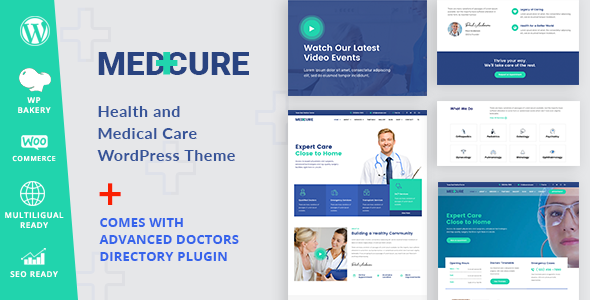 Medcure is a fully responsive WordPress theme that is professionally designed and developed for the websites of medical practices, dentists, doctors, surgeons, hospitals, health clinics, paediatrics, psychiatrist, psychiatry, stomatology, chiropractor, veterinary clinics and other related medical related practices. No coding or advanced programming knowledge is required, with only one click you will be able to import the demo content and initiate the installation. Powerful premium plugins are included with Medcure, so you always have the right tool for the right job, including the Visual Composer premium page builder, the Revolution Slider to craft gorgeous, engaging experiences for your users and the WooCommerce e-Commerce plugin suite. It provides a simple roadmap to create a great-looking website, Fully responsive to give your customers a chance to reach you via their mobile devices and many other handy functions and options to create a strong virtual presence for your logistic business!